While the long-needed repairs to 24 Sussex Drive have been getting most of the attention, it's not the only prime ministerial residence where the government is spending money. Harrington Lake, the prime minister's lakeside retreat and official summer residence about 30 kilometres northwest of Parliament Hill, has been getting some improvements as well. Documents obtained by CBC News through an access to information request show that since Justin Trudeau came to office, there have been several upgrades to the five-hectare property in Gatineau Park, including the installation of a sauna. The prime minister paid for the sauna himself, but it cost $4,368 to provide electrical service to it. A new screened patio cost approximately $10,000, and three patio umbrellas and stands were purchased for about $3,000. An old deck and floating dock were replaced for $12,000 each. There are also new boat racks, which cost $8,500, and a $5,000 golf cart, which is used by staff and by the family. The NCC initially said a new playground structure with swings cost approximately $7,500, but after the costs were raised in Question Period this week the NCC clarified the prime minister paid for the set personally, while the NCC paid $1,800 for installation. Installation required cementing posts into the ground and the NCC said they take on any installation costs because of the risk to underground utilities. In the winter months, the snow removal contract at Harrington Lake has increased by $17,000 to $45,000. The National Capital Commission (NCC) — the Crown corporation responsible for the upkeep of 24 Sussex, Harrington Lake and other official residences — says a round of changes and upgrades are typically made for each new PM. The cost of wiring the sauna was originally pegged by the NCC at $65,000 — when it was to be surrounded by a new deck. But those plans were eventually scrapped. "The idea, considered for a while, to move the sauna to a constructed deck was discarded. It remains in the original location," said NCC spokesperson Jean Wolff. The Prime Minister's Office (PMO) agreed with the less costly approach. "The costs were lower and the logistics were simpler," said Eleanore Catenaro, the prime minister's press secretary. According to the documents, the sauna might go with the family when Trudeau's time in office comes to a close. But Catenaro said it would be "premature to speculate" about that. The boat racks replace old ones, and the NCC also purchased a new canoe, two kayaks and two paddle boards. The winter maintenance budget at the four-season getaway was increased to groom cross-country ski trails and clear snow from the area around a new outdoor fire pit. "The prime minister and his family enjoy the outdoors, and enjoy spending time at Harrington Lake," Catenaro said. Conservative MP Peter Kent said Harrington Lake needs to be maintained, but doesn't believe taxpayers should bear the entire burden. "I think the additional snow removal and the grooming of cross-country ski trails is something that some Canadian families might have trouble with," Kent told CBC News. Kent said Harrington Lake provides a needed escape for the prime minister and his family, and is sometimes used as a venue for high-level meetings with foreign dignitaries — but there are limits. "The prime minister should have paid for the installation of his personal sauna," Kent said. 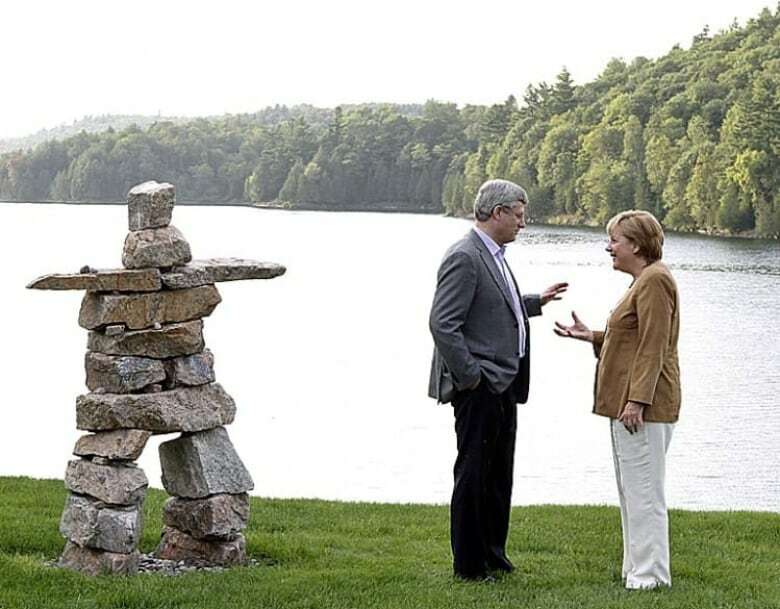 Prime Minister Stephen Harper, left, chats with German Chancellor Angela Merkel at Harrington Lake in 2013. Former prime minister Kim Campbell set up residence at Harrington Lake during her brief tenure in office because her predecessor, Brian Mulroney, was still living at 24 Sussex Drive. The government purchased Harrington Lake in 1951 and it became an official summer retreat in 1958 under Prime Minister John Diefenbaker. There are three main buildings: the main house, a guest cottage and a caretaker's residence. The property also needs more significant upgrades, with $1 million set aside in the 2016-17 budget for masonry work, window replacement and upgrades to the buildings' heating and cooling systems. Wolff said that work is still in the design phase. While the primary official residence prepares to undergo renovations, the Trudeaus have moved to Rideau Cottage on the grounds of Rideau Hall. Rideau Cottage has also undergone about $2 million in recent renovations, mostly related to security. An earlier version of this story indicated the playground structure and swing set cost $7,500 based on information the NCC provided at the time. The NCC has now clarified the prime minister bought the set personally and the commission paid $1,800 for its installation.